Oh Maclaren Mark II, how we will miss you! 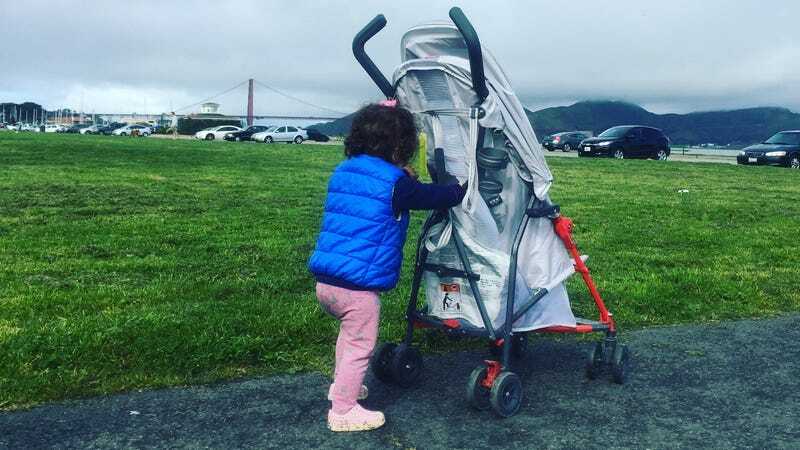 You were the 7 pound light that came into our lives when we were exhausted from trying to fold and unfold our too-big, too-heavy, too clunky City Min stroller. How you squeezed into bodegas and withstood countless beatings by baggage handlers. Remember that time I forgot you on a balcony in the rain? Yet there you were, the next morning, looking more resplendent than ever. I will forever miss your huge sunshade, your generous cargo hold (to be fair, I stored more of my stuff there than my child’s stuff) and your ability to fold and unfold with one hand, even while carrying a giant toddler and a purse. I am so happy I added a cupholder to you, to accommodate my tea. I will remain forever grateful for your smooth ride even on rough terrain, and your unmatched hardiness (remember when I used you as a jogging stroller on a dirt road for 6 miles?). Sorry for that time I spilled a hot latte all over you, and the time a pigeon tried to land on you. Sorry for the time my child used you to knock down a bunch of ladies at the airport. May you bring your next family as much joy and use as you have brought ours. Thank you.